Cloud TV coming to India – Is India Ready? Star India has announced the impending launch of its cloud TV service in India. While the concept of putting all the content into the cloud sounds exciting, we need to understand what cloud TV means and what dynamics does it change in the content distribution and production industry of India. What will happen to the media industry in India? Though Cloud is not a metaphor for the Internet, it can be understood in the same way Internet is understood. Cloud is a central repository of content of all types which is easily accessed using the Internet. The cloud can be used to host the content and retrieve it. For someone like Star India, the cloud removes the hassles of hosting and securing the content. All the activities are handed off to an expert third party. Amazon and Rackspace are the two popular cloud hosting services. Netmagic is a India based cloud service provider. Many Indian companies and institutions are already using the cloud. Redbus, ESPN (T20 world cup streaming), Manipal University, Stockbroker India Infoline, Ogivly India, Greytrip, V-serv digital, Hotelogix, Classle and Marcellus TV are all using cloud computing for some or all of their services. TV Websites use clouds to handle breaking news. 1 What is cloud TV? 2 What happens to the cable guys and DTH operators? 3 Is India ready for Cloud TV? Television is all video. Traditionally TV is consumed using a television set with a cable connection. Now any device which can connect to the Internet could consume video and the television content in digital format. 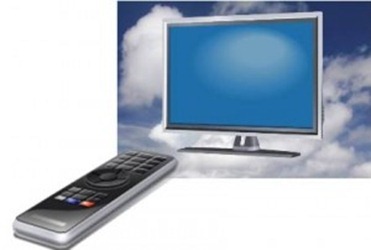 It could be a live telecast or pre-recorded programme, both types can be consumed using cloud TV services. Best part about cloud TV is, there will be no missing of content. One can simply log back in, search or browse for the missed content and watch it. With Cloud TV, the medium of hosting and distribution is changing which makes it easy for new age devices like tablets and smartphones to consume content. Cloud TV moves the distribution on to the Internet and thus democratizing it. What happens to the cable guys and DTH operators? They will not fade away. Not anytime soon. But there are bound to be some changes. When DTH operators came in aggressively, cable operators across the country started distributing set-top boxes to extend the number of channels and provide digital content. This has only slowed down the cable’s downfall. Go to India’s hinterlands and you are bound to find any of the 6 DTH operator’s dish on top of the houses. Cable though still prevalent is now engulfed by DTH. A similar change will happen with DTH too. Someone who is on the cutting edge, will buy a smart TV which can connect to the Internet without any dongles. For the rest who are on the cutting edge but don’t have a smart TV will go with a set-top box which can make any TV smarter. This set-top box will slowly replace other set-top boxes until there are more smart TV’s. The whole thing might be 5-10 years away and is closely tied with the Broadband roll out in the country. But it is bound to happen. DTH is a distribution channel and with cloud TV, the traditional distribution channel is replaced with Internet. DTH companies which distribute and hold content like, Sun and Dish, are safe for a while. Sun DTH and Dish TV both hold a portfolio of channels through their networks Sun Networks and Zee TV. With companies holding both distribution and content, they are bound to have their vested interests in keeping the existing DTH operations going. They will delay the movement to Cloud thus reducing the number of choices for cloud TV consumers. But they cannot make it go away. Is India ready for Cloud TV? Traditionally India has been very adaptive to change and technology. It’s as if India and technology are inseparable. There were multiple services which were launched sceptically in India, yet they took off. Mobile phones and DTH are two such examples. Cloud TV is a natural progression to India’s technological embracement. If delivered properly, cloud TV could take off in a serious way. After all there are more than 500 million small mobile screens hungry for video content – be it melodramatic saas-bahu serials, Shah Rukh’s darde disco with six pack or Dhoni’s helicopter shots. I’m sure the question of Is India ready for a mobile phone was posed back in the year 2000. India unfortunately defines 256 kbps as broadband. Though it plans to revise the minimum requirement for broadband to be 2 Mbps, it’s still years away. Between 3G and Broadband there are little over 20 million subscribers in India. If launched today, Star India’s cloud TV will reach only 20 million subscribers. For the service to reach as many as possible, content producers have to take care of the distribution to ubiquitous small screens. Content producers has to optimize its content to suit to lower speeds and smaller screens. Since the content is available digitally, content producers has to work at ways to increase the reach. It could be tying up with handset manufacturers to pre-load TV apps or it could be providing apps (like Android) for various mobile platforms, and optimizing the apps to work for lower bandwidths and smaller screens. Rebranding: Why Al-Qaida, Old Spice and Madonna are trying to reinvent themselves over the years! There are some big assumptions. Firstly "Between 3G and Broadband there are little over 20 million subscribers in India. If launched today, Star India’s cloud TV will reach only 20 million subscribers." – Basically you are assuming that every 3G and Broadband subscriber will subscribe to Star India's Cloud TV. Out of these 20 million, I am guessing approx 2 million will subscribe. For Cloud TV to take off in India, broadband penetration needs to be much much higher than what it is today. 3G speeds just don't cut it if you want to watch decent quality video on your mobile device. Broadband speeds is a major letdown in India. I feel that in a country like India, it is better if all efforts are focused towards Wireless Broadband instead of DSL/Cable broadband. Case in point is the difference in Mobile Phone subscriber growth and traditional land line telephone subscribers. Classle shares a spot along with ESPN and TV sites like Marcellus TV..Great to have mentioned.